How a mobile app is designed will define how delightful the user experience is. As a mobile app development designer, you must pay heed to certain UI/UX principles while creating your mobile app. Launch yourself into a “mobile” mindset and design casting away anything not particularly suited for the mobile space. Function is paramount but skill is an amalgamation of style, function and usability. First and foremost let the purpose of your app be reflected by an explicit name, description, and appropriate aesthetic and make the target reveal itself clearly through every facet of the mobile app development. The cause of your users must be top of mind whatever the app’s goal is and let that shine through every facet of the app so that the engaged user remains engaged and doesn’t leave. 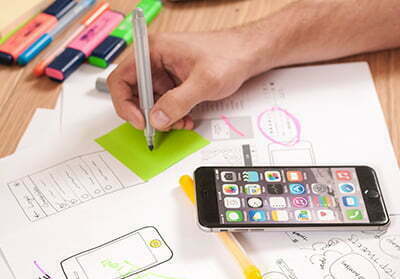 As you go about designing view the mobile app design from the user’s perspective, realize their needs and develop the app according to what they want to see in it. Simplicity and convenience go hand in hand when trying to up the user experience and get users to use your app. So let each section on your mobile app development unfold naturally in a smooth flow, engaging the user. The user is looking for icons, button, and other key elements quickly so avoid hiding them in any sort of menus which will frustrate the user. In your mobile app development select the right navigation model for integrating each navigation element into the available screen. The mobile device being small, one must ensure that the text, buttons, and other key elements you include in the mobile app development are limited to a person’s vision, dexterity, and finger size. Generally, 75% of the time people use their thumbs to interact on their mobiles. However, the fingers are more flexible, and they have better control of their screens when they use them. A small button or link will make it difficult for the user to click as this restricts the flexibility of their finger movements. These factors must be considered while designing the app. Where iOS and android app development is concerned if you are planning to extend from one application to the other one or if you are developing a platform-independent app ensure your mobile app design is flexible for such a requirement. Moreover, the focus should be on making it compatible on different platforms. If this is difficult to get done invest in different app versions for different platforms keeping your targeted audiences and their preferred platforms in mind. Test the app functionalities for any bugs. You can use different usability tests like remote testing and user testing to ensure you deliver satisfaction to your customers. Test on as many physical devices as possible, use online tools to virtually test the app on multiple size and manufacture devices which is even more important for the Android platform where manufactures often customize the operating system. Excite your users to try your app and revisit it frequently by posting feature updates at regular intervals. Best of luck with your app journey!